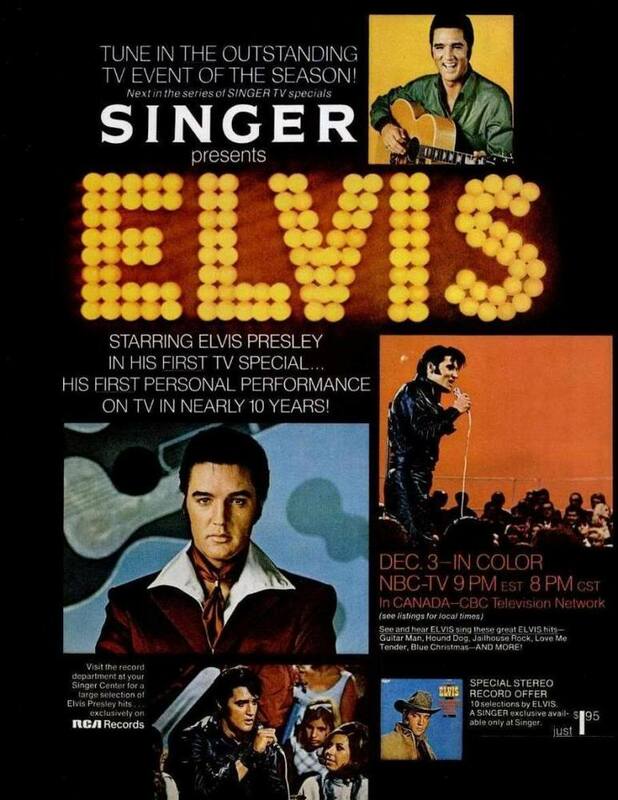 Parker, as well as the Singer Company and RCA Records, knew Elvis’ first TV appearance since the Sinatra show in 1960 was bound to be something very special, and plenty of advertising was done prior to the screening of this landmark show on DECEMBER 3rd 1968. 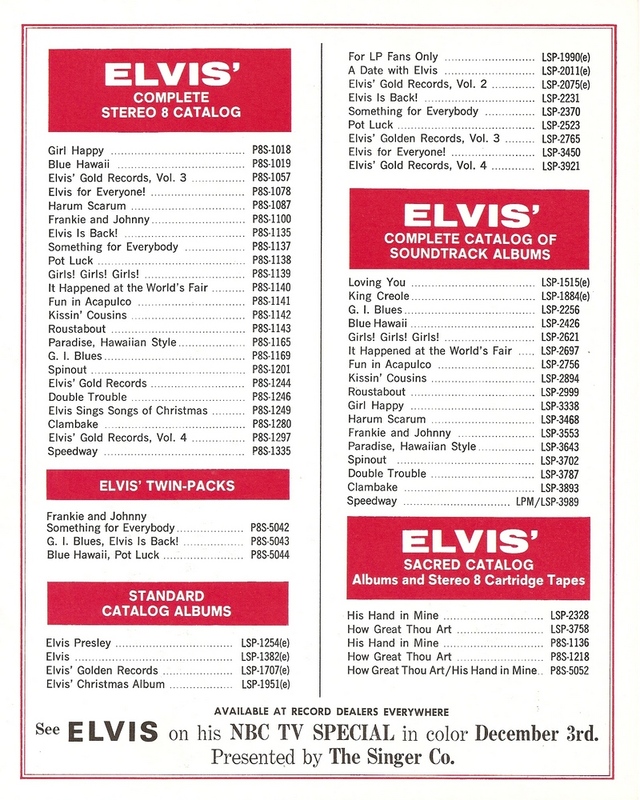 In this article we’ll present a collection of promotion material from late 1968. 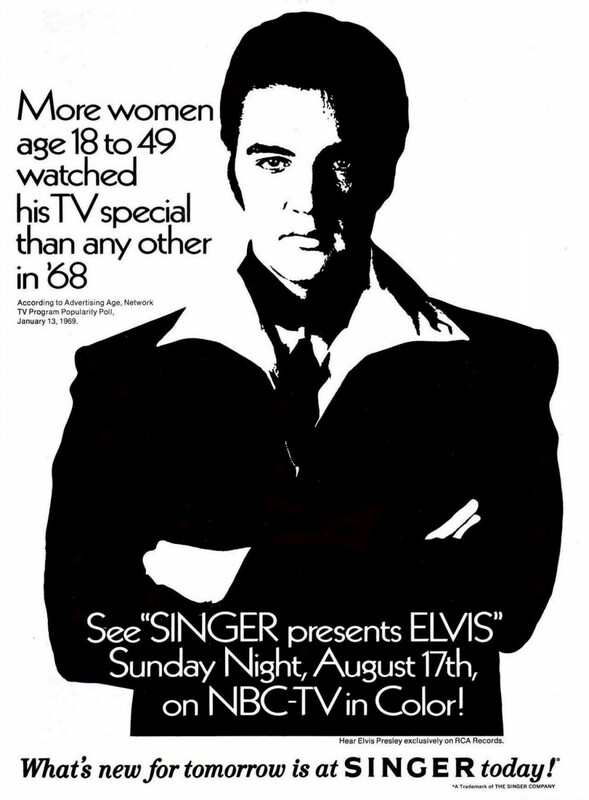 We’ll also take a look at AUGUST 17, 1969, when NBC aired the show for a second time. Above and below, we see the front and back of a PROMOTIONAL CARD (sized 3″ x 6″). This BANNER/POSTER measures 29.5″ x 15.5″. Here we have one of only a few surviving RADIO SPOT records. 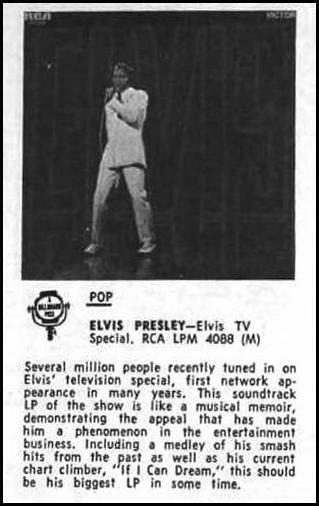 This nowadays extremely rare item was sent to Radio Stations across the USA and the commercial that promoted the TV Special was heard nationwide shortly before the Special aired. 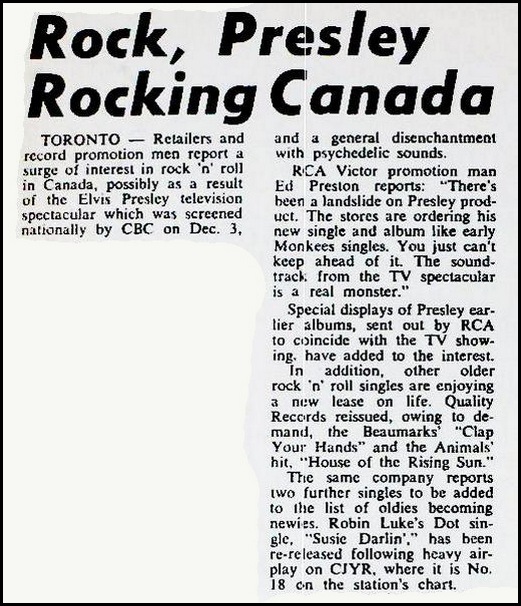 Once the Special had been aired, the Radio Spot did not make sense anymore, so most of these records were destroyed. To the right we have a BANNER that was used by Singer for in-store promotion. Here we have the largest promotional item. This very nice POSTER measures 24″ x 36″. 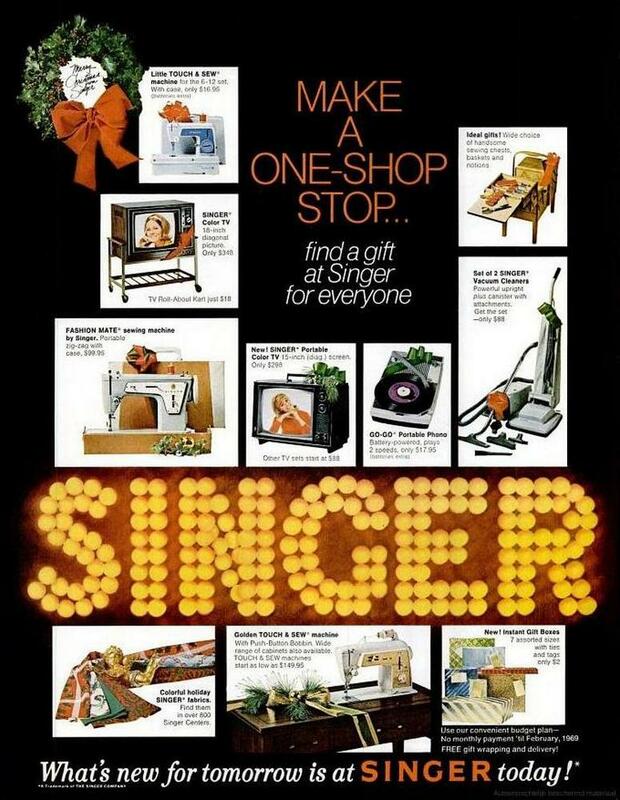 The extremely rare 22″ x 28″ STANDEE to the right was on display in Singer stores. According to the Auction House that sold this beauty (for $ 1900,-), only two of these are known to still exist today. This design was also used as a MAGAZINE ADVERTISEMENT, an example of which we see below. 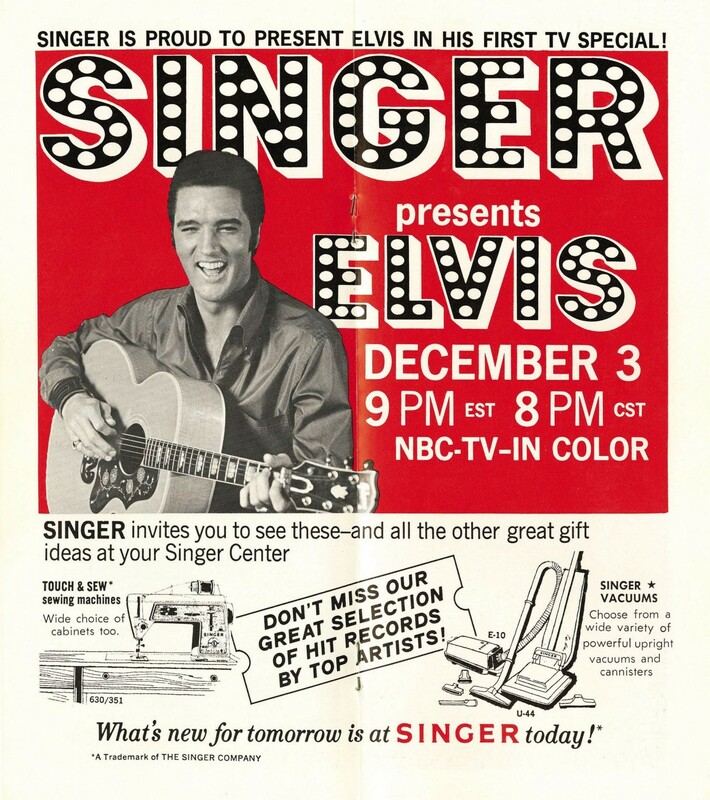 The phrase “Singer Presents Elvis” was used on each and every promotional item brought forward by the Singer Company. So it made sense that the title of the budget LP would also contain this phrase. Released in October 1968, this compilation of mainly forgettable filmsongs, also contained the first ever release of a song recorded for the TV Special. TIGER MAN gave the fans a sneek peek at what was to come in December. It must have been a thrill to hear the rawness in Elvis’ voice for the very first time! 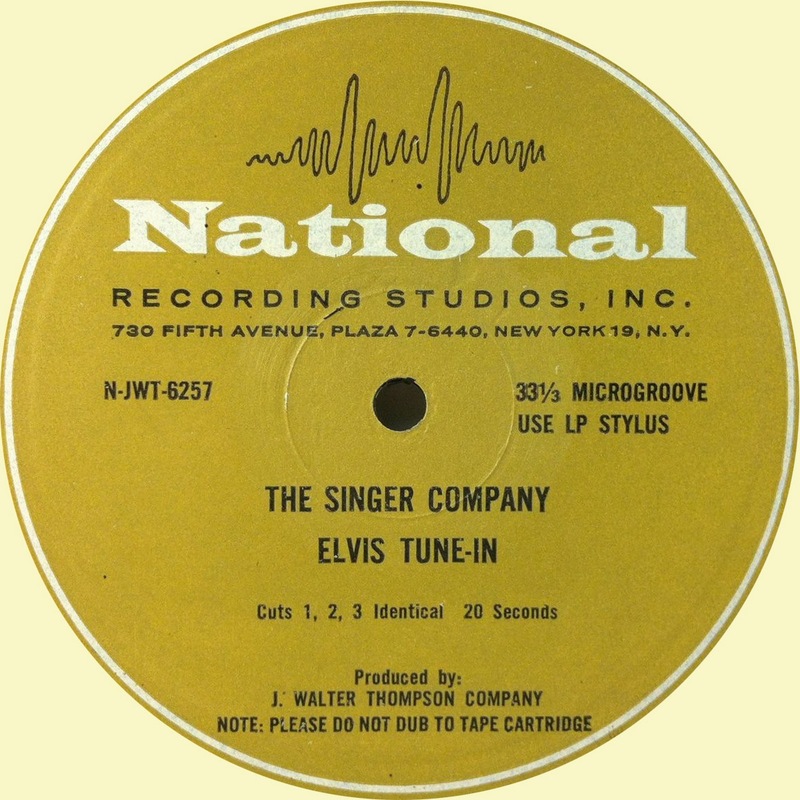 When this album was re-released by RCA on their CAMDEN label five months later, “Singer Presents” was dropped from the cover. Below we see the BONUS PHOTO that came with the purchase of this LP. 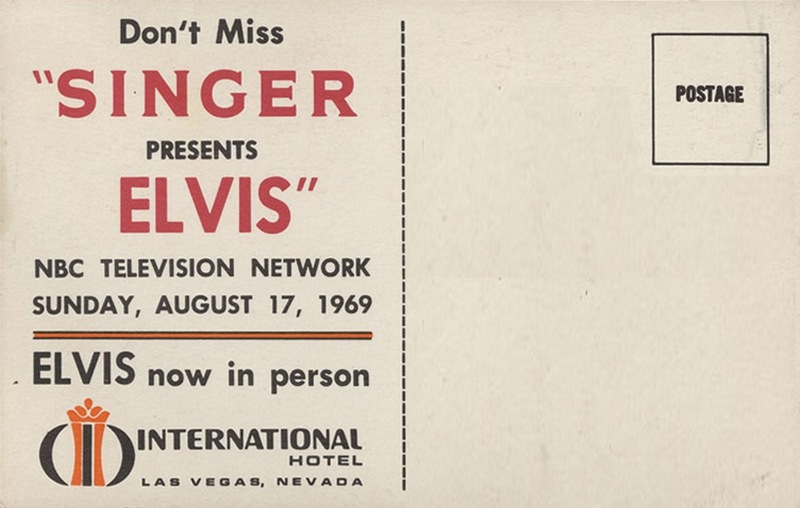 Unlike all later prints, only the first edition contained a reference to The Singer Co. and the air date on the back. From LIFE magazine, a DOUBLE-PAGE AD. Left we have a (low rez) NEWSPAPER AD from a few days before the airing. And to the right a FULL-PAGE ADVERTISEMENT that is almost identical to the one Singer used (as the right page of their two-page ad) in LIFE. The only exception is that Elvis can now be seen in lower left corner. To the right a FULL-PAGE ADVERTISMENT for the Show from TV Guide (November 30, 1968). 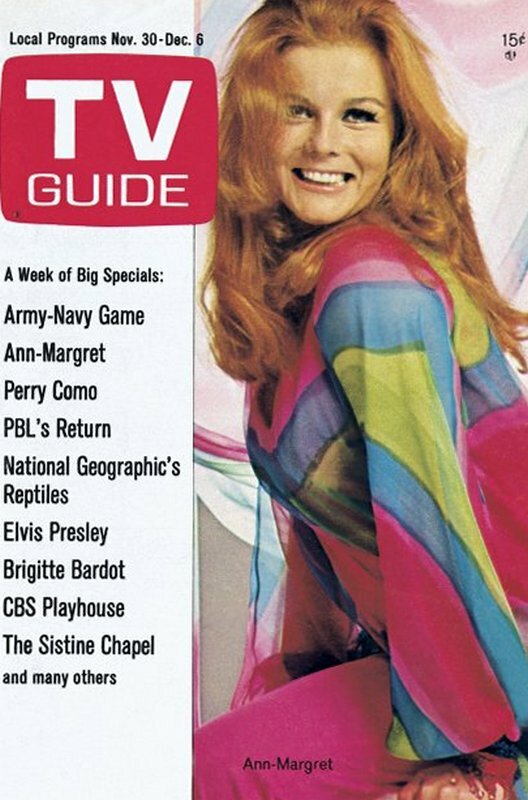 (Not Elvis but) Ann-Margret was on the cover of this weeks edition of TV Guide. 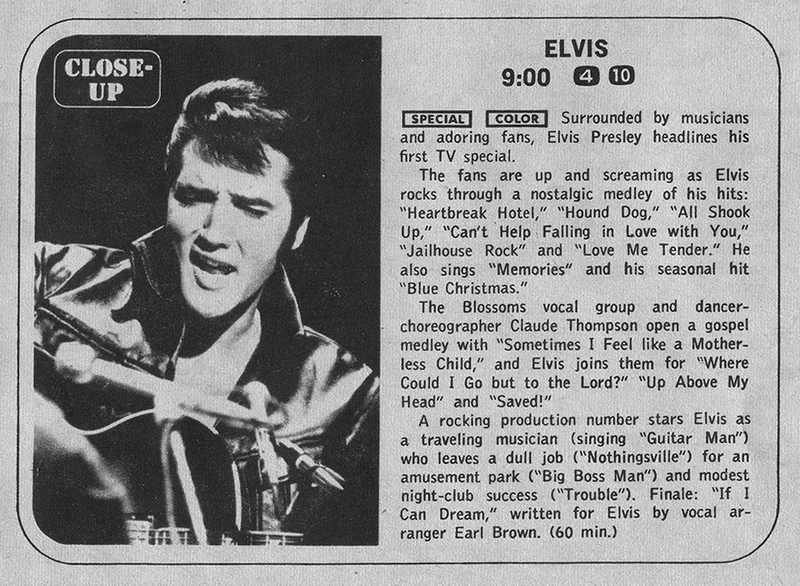 And below we have the listing in that same TV Guide on the day of the broadcast. This is the official PROMOTIONAL BOOKLET. 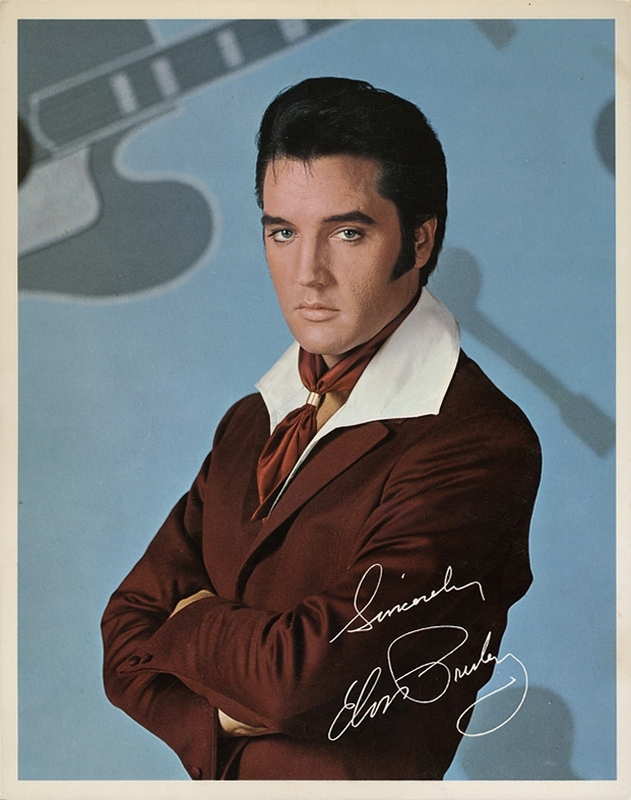 It measures 4″ x 9″, consists of 32 pages, and it features the famous image of Elvis in his Gold Suit on the frontcover. To the right we have the center-spread of this booklet. 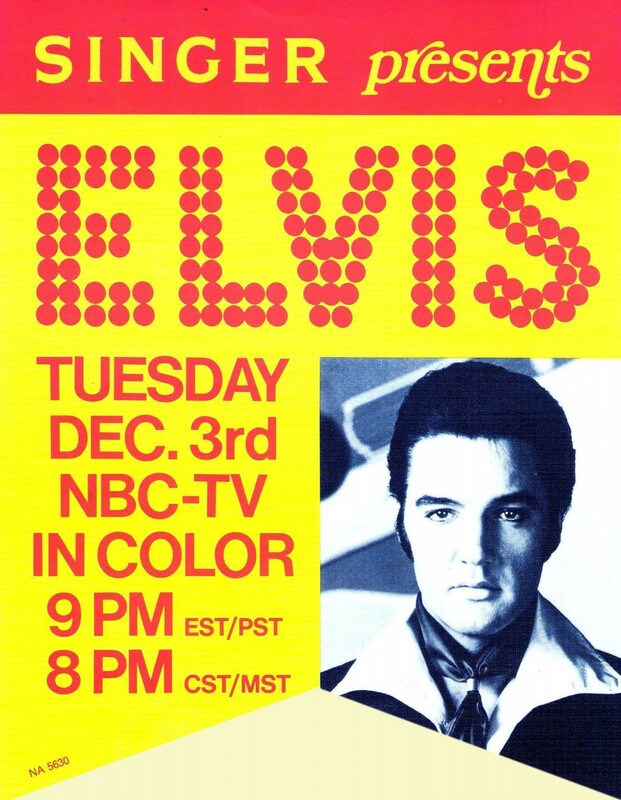 Here we have the final entry of the December 1968 Promotional campaign for the NBC TV Special. 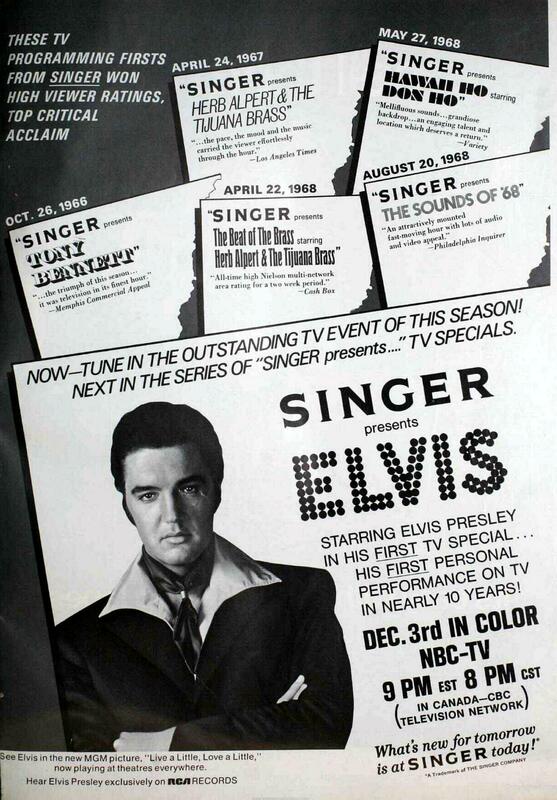 This is a FULL-PAGE ADVERTISEMENT from the Singer Company in Billboard, from a few days after the special had aired. But wait! 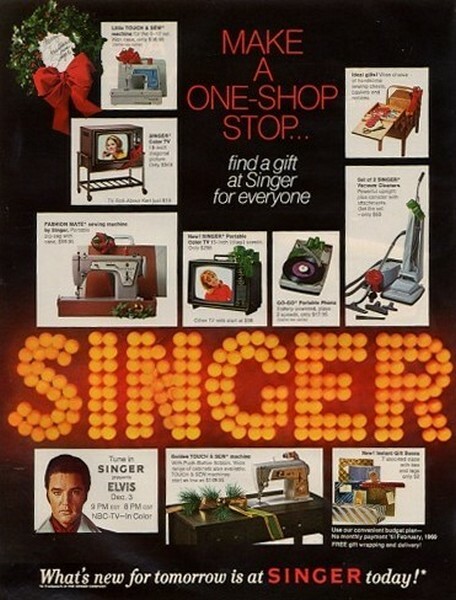 RCA has also bought itself a few inches of advertising space in this Singer ad. And yes, there is also the reference to go see Elvis in his latest MGM movie. Phew, what a relieve! 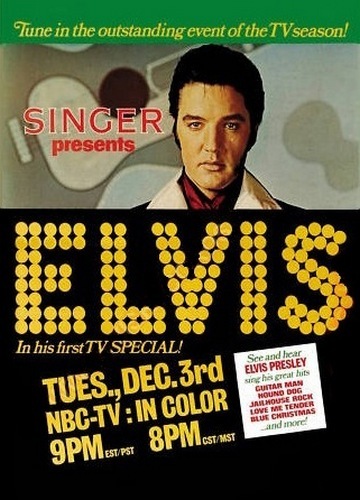 The NBC show aired for a second time on August 17, 1969 and once again some interesting material was produced to promote the Show. First up is a very rare TABLETOP STANDEE used in Singer stores. This item measures 22″ x 28″. Here we have a cool FULL-PAGE ADVERTISEMENT from Billboard, August 16, 1969. 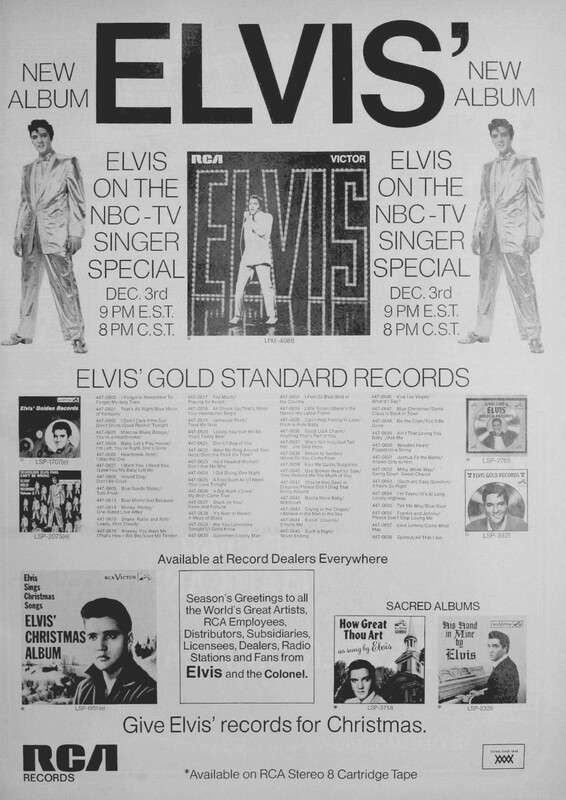 A Singer NEWSPAPER-ADVERTISEMENT simultaneously promoting the re-run of The Special and Singer’s Flaming Star album (now even cheaper than the first time around). By this time RCA had also released this album on the Camden label. Below we have a FLYER from August 1969. 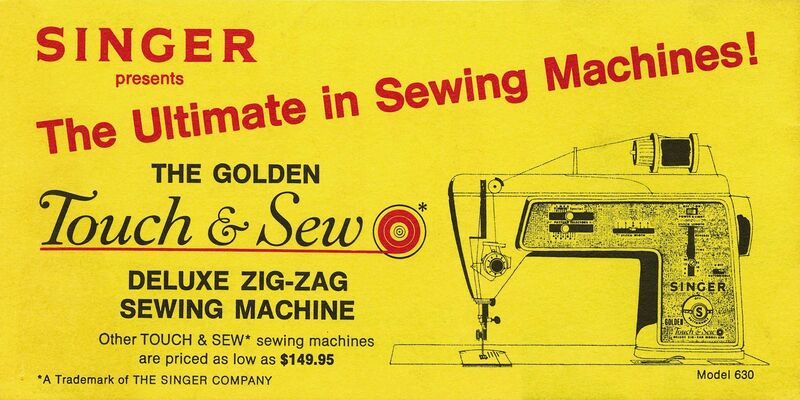 And here we have a promotional POSTCARD that was presented as a give-away at Singer Centers. The card shows up on auction sites from time to time, so we can assume it has been printed in a (relative) large quantity. 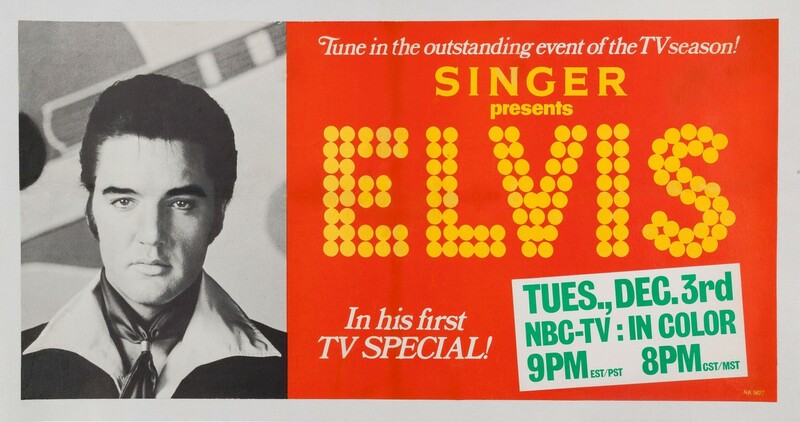 The postcard (measuring 3.5″ x 5.5″) promotes both the second showing of the TV Special as well as Elvis’ first season in Las Vegas. 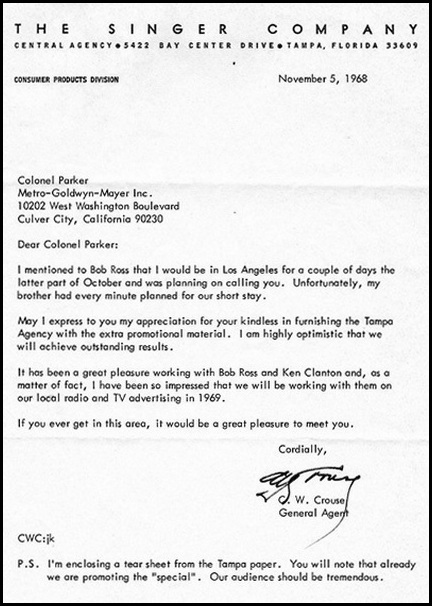 BELOW: a letter from Singer to the Colonel concerning the promotion for the Show. “The soundtrack is a real monster”. From the same edition of Billboard, a short review of the LP: “This should be his biggest LP in some time”. My sincere thanks to DENNIS BERRY for his help in putting this article together. Also thanks to CAYETANO for supplying a scan of the Flaming Star bonus photo. And (as always!) my thanks to GER RIJFF for his help. shows in Burbank, by one of the fanclub members, was also included. kept us all going. 1969 was a blast! It must have been great after all those years of movies to hear Elvis this way again. He was at the top again. Great stuff!! All the excitement fans felt when this was originally aired…after all those crappy movies this was an absolute relief. Yes, Elvis finally wowed them again! Sadly, it wasn’t to last long before he went downhill again. 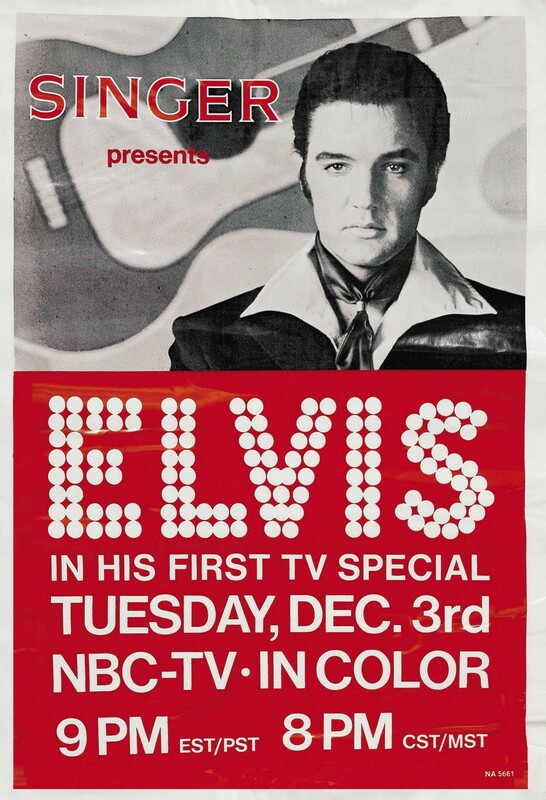 I remember having the New York Daily News in a study hall class in the spring of 1968 and seeing Elvis and NBC were planning a TV special for later this ear. I wish I had kept that article. I still remember reading it like it was yesterday and the feeling I got. I didn’t know what to expect. Thankfully, Steve Binder was on the scene. These promo items bring it all back. Once again a fantastic topic! God bless Steve Binder! Without him the NBC show would have been as bland as the movies El was making at that time. regular RCA ones from the time? Different in color perhaps? Input is appreciated. This stuff is glorious and original. In keeping with the overall ‘Echoes’ site. Magic! Outstanding work Bob, nicely gathered in one place for the world to see. Thank you. I made a site some time back with extensive pics, but I haven’t promoted much. This is Fantabulous Bob, I love all of this, thank you very much for this, there are quite a few pictures here that I have never seen before. 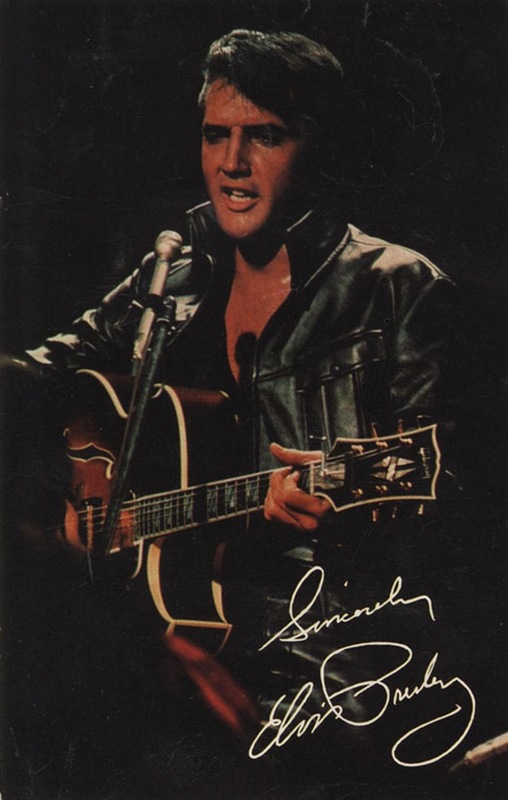 Your whole website is a must see Elvis site for fans to come to and enjoy all you have done. Wonderful & outstanding work on the ´68 Special. I was very young so missed all of this. I didnt see the show until 1978. A great show. Very well done piece. 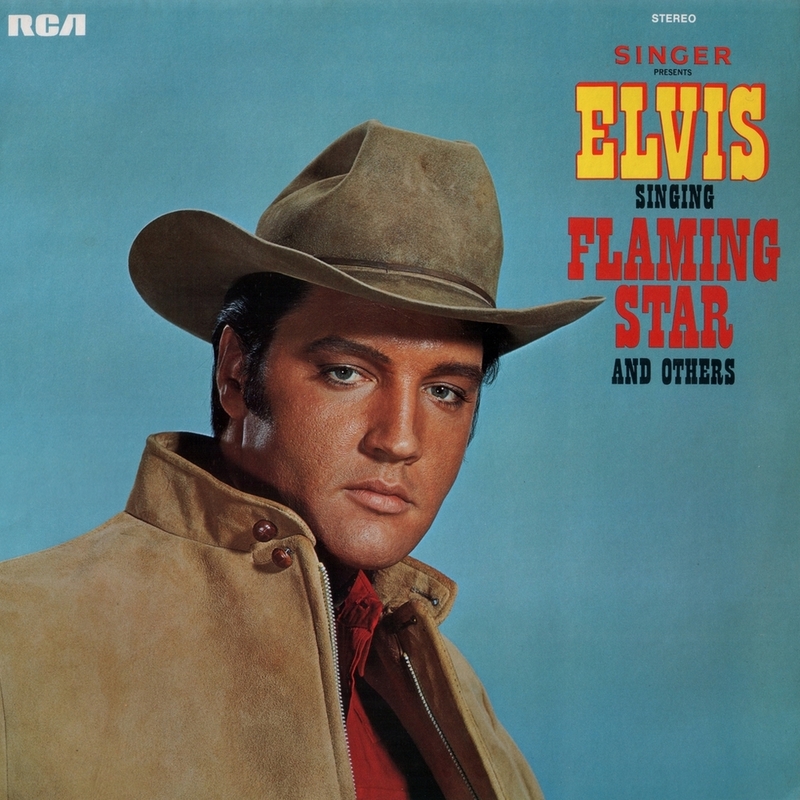 Marcus’ comments on the album are noteworthy, not only for the errors you indicated, but for his observation about the crossroad Elvis faced at that point. He could have gone in many directions and I agree with Marcus’ praise for Elvis as a blues singer. I think Marcus may have missed the point of the special, as far as Steve Binder was concerned. Binder wanted to capture Elvis as he really was as a kind of antidote to the image of him created by a decade of films. 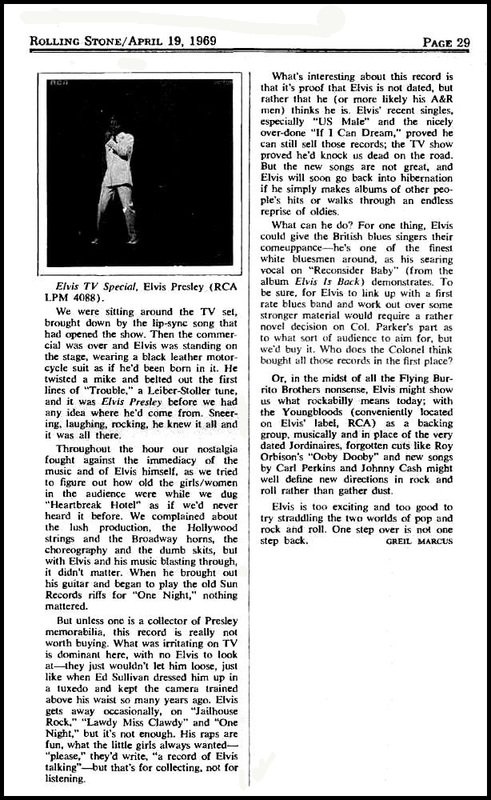 The live pit segments did that for him, although he originally wanted to tape the actual informal jam sessions Elvis held each day in his dressing room, which is what gave him the idea for the pit segments. The special celebrates Elvis’ earlier achievements while also telling the world that he was still a great performer and entertainer with deep musical roots. The official title of this special remains something of a mystery. 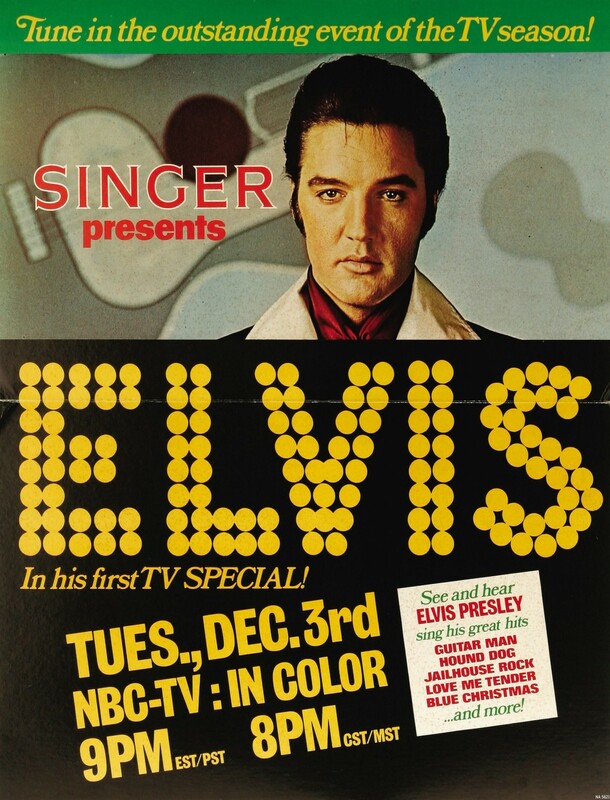 In nearly all of the material you display, the title is given as “Singer Presents Elvis.” However, the only title that appears on screen at the start of the program is “Elvis,” which seems to me the most appropriate title. It also is the only title on the original LP cover. 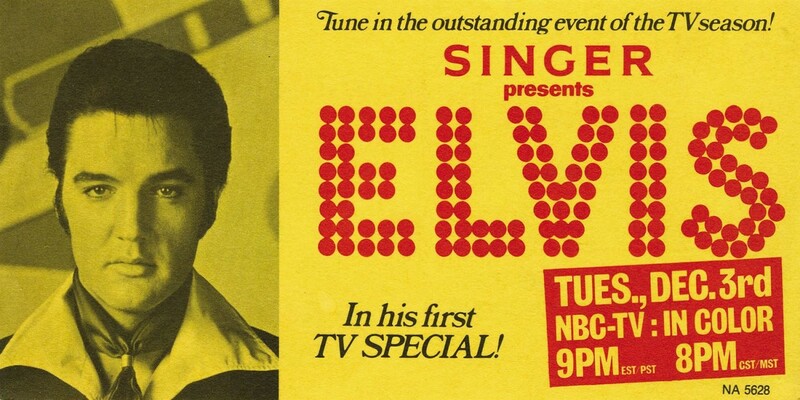 In my book, “Channeling Elvis: How Television Saved the King of Rock ‘n’ Roll,” I use the one-word title. I don’t have the book, unfortunately, but I’m pretty sure it’s in there. 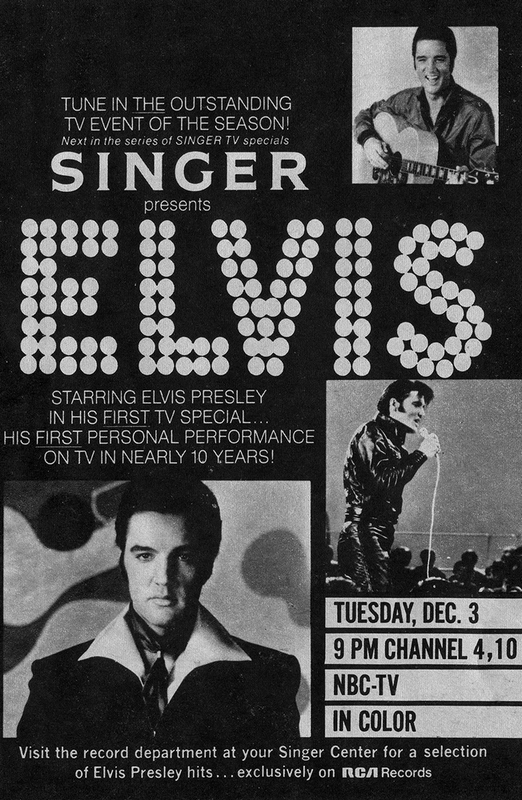 I have an unusual question: I collect Elvis 1970s memorabilia and own one of the two Reels of the Opening Night, January 26, 1970 Show. Do you have any idea how could own Box/Reel# 2 ?. I think it was shown in one of the “The American Way” CDs. I like to reunite both reels! 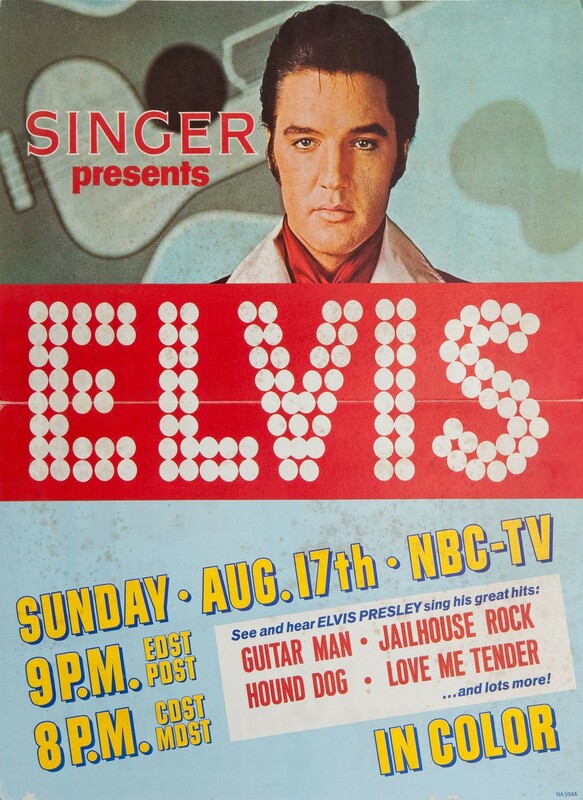 do you actually have a copy of the 1969 Aug 17 rerun airing of the NBC TV Special? If so do you have any idea how much it is worth? I was 14 years old, and probably the only kid in my class who was hip to the Young Elvis Presley, having recently come across a used Elvis’ Golden Records lp from 1958. Hearing Jailhouse Rock and All Shook Up for the first time was almost as exciting as when I’d first heard The Beatles. My friends all knew Elvis from his movies, but he was a relic of another age . . . That all changed on that December evening. You may recall, Jim Morrison wore black leather pants onstage, which was considered very cool. Now, here was Elvis decked out head to toe in black leather – which, in my book, made him COOLER than Morrison. And it didn’t stop there. His hair, his face, his voice, his songs . . . it wasn’t nostalgia. Elvis suddenly fit right in with what was happening NOW. Suddenly, Elvis was “GROOVY”! The next day at school, everybody was talking about the TV Special. I guess we’re still talking about it.